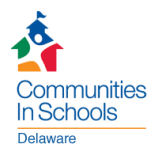 Communities In Schools of Delaware (CISDE) surrounds students with a community of support, empowering them to stay in school and achieve in life. CISDE partners with 12 schools, providing targeted and sustained services to 889 “at-risk” Delaware students and their families (2014). Every 26 seconds a student drops out of school. One‑fourth of high school students don’t finish on time; about half of all black and Hispanic students won’t make it to graduation. The consequences of this crisis affect individuals, families and the larger community. Dropouts are more likely to live in poverty, suffer poor health, be incarcerated or be dependent on social services. Over the course of a lifetime, a dropout earns, on average, $260,000 less than a high school graduate.